Fresher exterior, new interior lighting, new front corner overhead lockers, solar 100 watt panel, fridge/ freezer, good storage in L shaped kitchen, wired up for mover and has DAB radio. No rear kitchen window, no washroom window, battery in floor, no seat base access flaps, and restricted exterior locker storage. Its official, the Unicorn range is Bailey’s top sellers and to keep that up takes some careful planning when it comes to any updates. So the fourth generation of Unicorns had to keep sales moving and tempt folk from brands such as Swift, Elddis and Lunar. So we took to one side the new Seville after the official launch, with its new layout that Lunar have used on their Lexon based Stella. 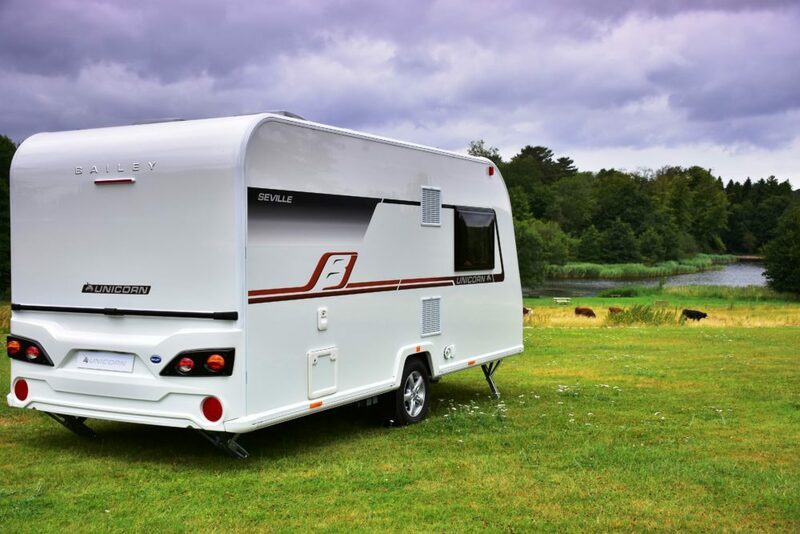 Using the end as an L shaped kitchen and keeping the washroom on the offside the Seville has we reckon more appeal. 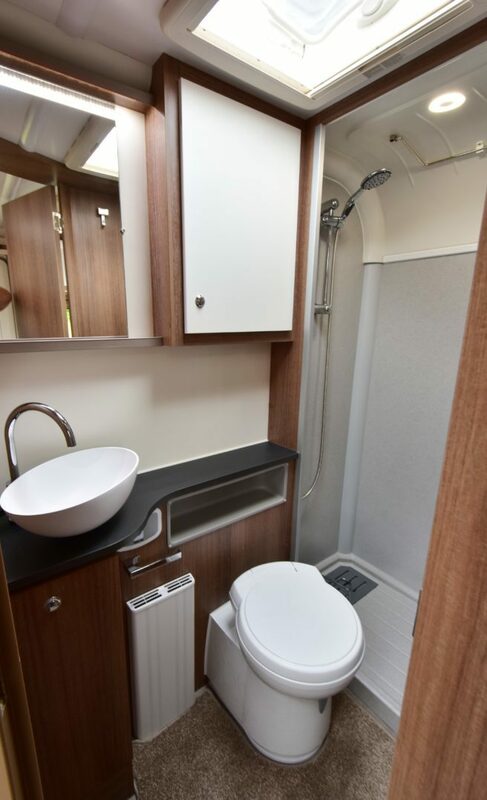 Elddis and Compass have also latched onto this Stella layout too so is this the beginning of a trend? No doubt about it the Bailey profile has been sharpened up. The new-style windows, but the bland back panel lacks a window – although we do like that full width rear grab handle. The split front window also acts as a sunroof too. For two, there is more than enough space in the lounge area, with extra space provided by the redesigned bulkhead. A central chest of drawers comes with a slide out coffee table that neatly pops back away out of sight. The seating has individual back rests and feels comfortable enough. Bailey has adopted Lunars trick of making use of the overhead front corners by making them into storage lockers, with the speakers placed on the front of them. The nearside locker houses the CD/radio, which is a DAB digital radio unit – most makers don’t fit these. LED lighting is provided above the roof lockers and in ceiling and corner spot lights. Strangely, no seat base access lockers are incorporated, so all bed locker access means taking the seat cushions off. 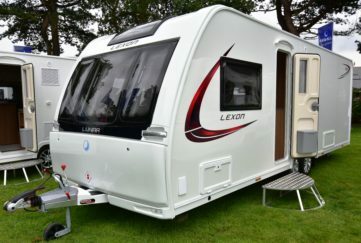 Rear-end L-shaped kitchens in two berth caravans disappeared back in the early noughties, but ABI and Lunar stuck with the idea. Now Bailey has come back to it for 2018, and it works well. The Seville’s kitchen has gained plentiful storage, especially with the deep roof lockers and corner shelves. 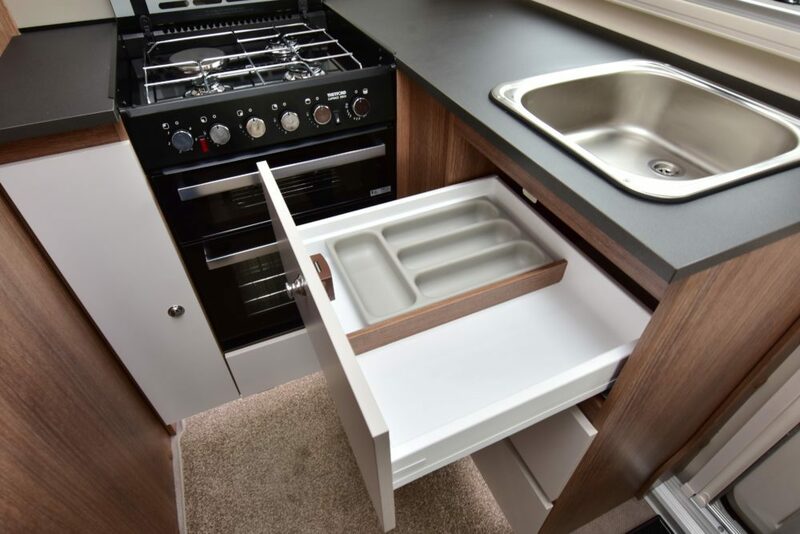 Beside a very practical worktop, you get a full oven with duel fuel hob, and a stainless steel sink with clip-on drainer. Fridge and separate freezer are placed next to the wardrobe, with the microwave built into the side dresser. Excellent night lighting is built in. The absence of a back window, however, means the Seville’s kitchen falls short of five stars. The lounge comes with good soft seating and separate back cushions. Bolster and scatter cushions are provided, adding to the comfort, and four can sit here with ample room. A free-standing table is available for main meal times, should you need it, with the seating providing good support. Making the beds up? Well two single beds are easily set up, and to make the double bed, slats are used to bridge the gap. It’s all pretty conventional so works well. The deep overhead roof lockers are helped out by good sized wardrobe. Under-seat storage isn’t bad, but with no front gas locker (it’s on the offside) a side storage locker eats into the nearside front seat storage. 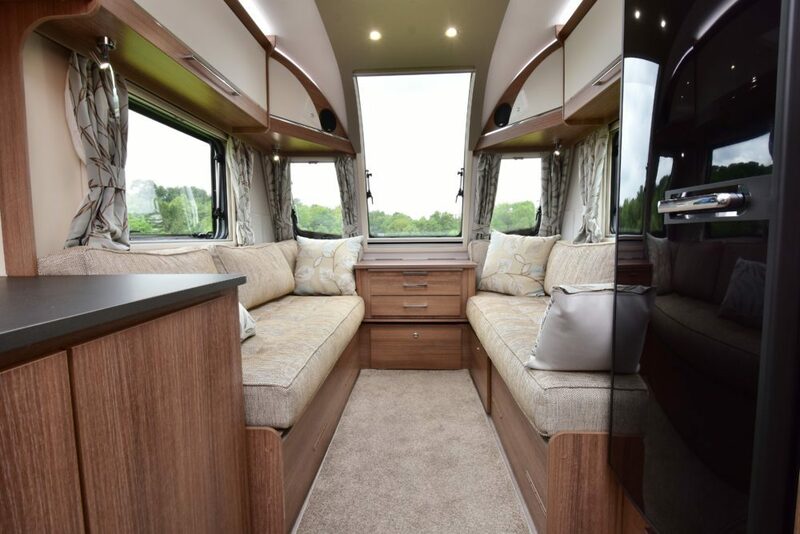 The dresser offers more storage, with a large cupboard and overhead locker plus a worktop. Storage i the washroom is also much improved. The side washroom is very good for this size of van, but with no window a roof vent has to suffice. The corner shower cubicle is a decent size, and a set alone basin adds to the upmarket feel. There’s an Alde radiator and Thetford electric cassette loo. The Seville in its new guise is a better layout. Fans of rear end washrooms may feel miffed, but to be honest it’s no hardship. The new interior has a more contemporary look, and with the new low-level lighting it gives the Unicorn a more upmarket feel. It’s a great tourer for two and it comes with a decent spec at a competitive price. 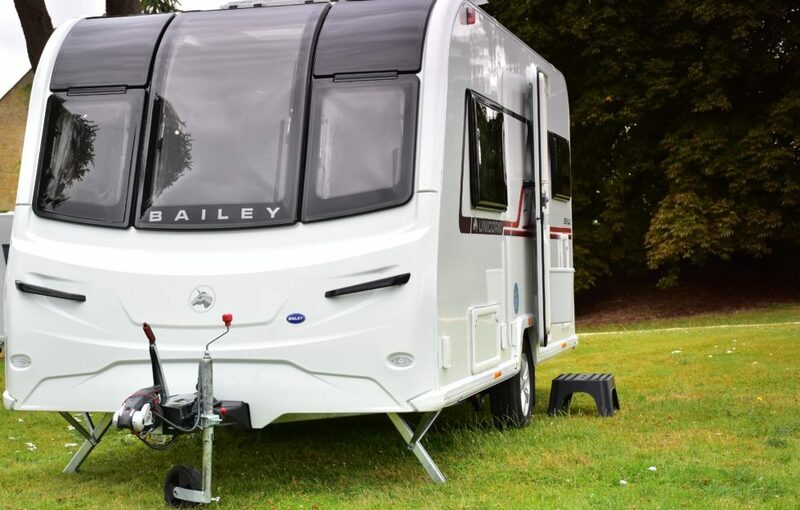 The new Unicorn looks set to keep up the accolade as Bailey’s best selling range, we reckon.